News this week is that Guinness Book of Records thinks my ride wouldn’t create enough public interest and is “a little too specialised for a body of reference as general as theirs”. I guess it’s hard to compete with the biggest falafel or the most people having breakfast in bed at one time! I stowed Effie away for a week in Turda & took Lynne touring through the north eastern & western part of Romania. You could pretty much pick any road to find amazing scenery. Dense forests, mountains, alpine fields, wooden fences, quaint houses with decorative gables, carvings & tin ornamentation. Old barns attached to the houses also decorated. Cheerfully rotund women with knee length skirts and headscarves worked in the fields raking up the hay, men driving long wooden carts hauled by horses, gypsies with their carts full of scrap metal or selling berries on the side of the road, with many of the women in sequined long skirts and bright scarves. Churches & monasteries adorned inside & out with frescos, fascinating cemeteries, including the richly decorated Merry cemetery at Sapanta where the wooden grave markers have paintings depicting the deceased. In 1935 Stan Patras a local artist began carving and painting these often amusing epitaphs of the locals doing their trade or something relevant to their lives. For the next fifty years the tradition has continued and 800 were made. They now attract thousands of visitors to Maramures region, close to the Ukranian border. It’s often described as the last medieval rural area in this part of the world because of the interesting wooden houses, barns & carts. Tourist stalls here sell everything from gnomes to fake fur hats and toffee apples. The roads we travelled frequently had switchbacks winding up the mountains, roadside restaurants with names like Edelweiss and looking like Austrian chalets. People are very helpful and friendly. Even when none of us share the same language we still manage to understand each another, usually by making signs. All across the country we saw hitchhikers of all ages flagging down cars for a ride. We took one little old lady from her village to the next with her chatting away in Romania, every now and again repeating, “Orstrarlia, Orstrarlia” with a big grin on her face. Perhaps she had relatives who emigrated there as many people we met seemed to know Sydney & Melbourne through family connections. As an apiarist I was fascinated to see the number of colourful mobile hive transporters parked in fields so the bees could forage on the surrounding flora. What an amazing way not only to move bees from one location to another, but also to keep them warm over winter. With meadows full of flowers I could only imagine the activity going on inside the hundreds of hives. Many towns were definitely catering to tourists, but it was only when we got to have home cooked meals in pensiuneas that we tasted real Romanian food. I have to say though I’ve had my fill of salami & cheese for breakfast and I looking forward to some really good bread again! Sinaia had some interesting old houses not seen in other parts of the country although many were badly in need of restoration. 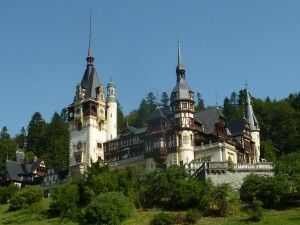 Here is where we visited Peles Castle, renowned as the most beautiful castle in Eastern Europe and well worth a visit. We opted for the full tour of about two hours. This covered rooms on 3 floors and highlighted the grand decor and ornate furnishings, chandeliers, paintings, armoury & treasures gifted & displayed in the summer home of King Carol 1st. One other site that we’d been told to visit near Brasov was Bran Castle, commonly known as Dracula’s Castle. Although fairly barren inside, especially compared to Pele’s Castle, the exterior was quite stunning on the approach up a long tree-lined drive. Before heading back to Turda to pick up Effie & begin the next leg of my journey we stopped the night in Sighisaura. This is a beautiful village with an impressive clock tower and carefully restored houses, though it somehow had the feeling of a film set rather than a living breathing village that the more rustic ones did. What made it worth stopping here a night was Pension am Schneidertaum. Sorin, the host not only prepares the tastiest breakfast we’ve had in the past six months but shares locally made wine to guests in the evening on the patio. This man definitely has hospitality down to a fine art. I left Turda under heavy skies with rain gear at hand and set off for Hungary. Just shy of the border I camped the night at a disused gas station and was awoken around midnight by Lynne who had hitched a ride with two guys in a truck on their way to Italy to pick up motorcycles for resale in Romania. They dropped her off on the outskirts of Budapest next morning. I meanwhile took the longer route once across the border. A cup of coffee & bottle of water was offered by the customs on the Hungarian side – a nice welcome into yet another country. Thanks to Laura & Adrian I met in Iran, who took the time to send me so many suggestions for places to visit in Romania – giving me a broader view of their stunning country which definitely rates as one worth visiting again! We are so glad that you enjoyed your trip in Romania. Maybe we can get together next time you visit. We are now in Kyrkystan, and planning to visit Uzbekistan before heading back home some time in October. No, I’m sure you don’t know the owner of the FN M60 I was referring to. Maybe I can arrange a meeting with him when you are in Belgium. By the way what places other then the FN factory do you plan to visit? I’m really looking forward to meet you. Probably in Bernkastel-kues first then. I’m having trouble with the spark plugs so maybe if we meet up you could point me in the right direction to a wreckers for some new ones? I found your website only a few days ago. What a journey! I admire you for making such a trip on this vintage motorcycle! I’m an adventurous motorbike traveller too but to do this on such an old bike. Hats off to you sir! I still have to read most of your posts so I don’t know the final destination of your trip but if you come to Belgium (maybe to visit the FN factory) I really want to meet you. If not I’ve read somewhere that you will attend the 10th International FN meeting in Bernkastel-Kues in September. That would also a possibility since I plan to go there if the weather isn’t too bad at that time. By the way one of my friends owns an FN M60 in original condition. Glad you are enjoying following my journey. The old bike has its moments but for the most part it is doing a great job. Yes, I’m coming to Belgium after the Bernkastel-kues rally so it’s likely we’ll meet up in one place or another. It’s always terrific to meet other motorcycle adventurers and hear about their exploits too so do keep in touch. The original FN M60 sounds interesting – is your friend anyone I might know? Thanks so much for the link. It is great to be able to share it with other blog followers. We watched & read a few of yesterday’s interviews – a lovely day with many wonderful people. Thank you again for all your support. Come on, all followers of Ron and Effie. GWR have their own idea of what constitutes a world record. We may not see the value in some of the attempts but it’s their right to choose. From my perspective I’d rather focus on sharing my journey with blog followers, friends, family and people I meet along the way. For me, that’s what makes my ride worth doing. Hi Ron. I envy wonderful experiences from Romania. This is one of the last countries in Europe, which still spoiling modern Western civilization – a beautiful nature. In Hungary, the plains, you’ll enjoy! In Eastern Europe, very few speak English – a lot of hands. Thanks for your good wishes. The whole journey is a wonderful experience. Will see you soon.